Dr. Srdjan Acimovic, candidate for the Plant Pathologist position at the HVRL, presenting on January 26th at 2:00 PM. Dr. Srdjan Acimovic, candidate for the Senior Extension Associate / Plant Pathologist position at the Hudson Valley Research Laboratory will be meeting with growers on January 26th at 2:00 PM. 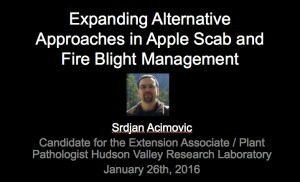 He will be presenting on “Expanding Alternative Approaches in Apple Scab and Fire Blight Management”. He welcomes your comments and questions regarding research and future work with the Hudson Valley Fruit Industry following his presentation. The presentation will end there after to be followed by a formal interview with search committee members. The presentation will also be presented live via Polycom conferencing to Cornell University locations in Geneva, Ithaca and Riverhead, NY. The incoming plant pathologist will be replacing Dr. Dave Rosenberger, recently retired in February 2014. During his retirement and the transition of the Hudson Valley Laboratory to increasing partnership with the fruit growing industry, Dave has continued to serve the region’s tree fruit growers with disease management advise and recommendations through his timely blog site. Srdjan recently completed his PhD program at Michigan State University Department of Plant, Soil and Microbial Sciences Applied Insecticide Toxicology Laboratory & Pesticide Analytical Laboratory. He completed his Masters of Science in 2009, Phytopathology, University of Novi Sad, Serbia under Dr. Jelica Balaz. His Thesis titled “Monitoring of Infection Intensity and Development of Specific Symptom Types in Apple Fire Blight”. His PhD project “Disease Management in Apples Using Trunk Injection Delivery of Plant Protective Compounds.” focused on a trunk injection approach and technology for disease and insect control in fruit trees. The projects encompassed applied and fundamental aspects of fruit tree trunk injection with conventional and alternative plant protective compounds. The research studied protective compound distribution properties in apple tree crown after trunk injection to control of apple scab (Venturia inaequalis) and fire blight (Erwinia amylovora) with SAR inducers and fungicides. During his PhD program at Michigan State, Srdjan has worked under George Sunden and John Wise. Srdjan’s CV provides addition details of his Professional Appointments And Employment. We welcome Srdjan as a very strong candidate for the plant pathology position and invite the Hudson Valley Growers to join us in her presentation on Tuesday, January 26th at 2:00 PM, in the Hudson Valley Laboratory conference room.